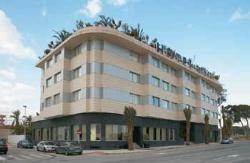 The hotel Areca is a very modern and stylish building which is situated in Torrellano which is very close to Alicante. It is only 2km away from Alicante airport which makes it extremely convenient for foreign holidaymakers. It is just 12km away from the centre of Alicante. They pride themselves on offering the highest level of service possible at a very reasonable price. There are a lot of facilities that guests can take advantage of, including the spa, gym, restaurant and beautiful garden.The restaurant serves Mediterranean cuisine, but also other dishes from around the world in case you are feeling a little bit home sick. 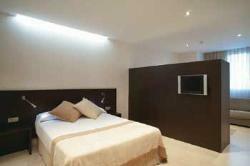 There are 56 double rooms, one suite, and 11 junior suites in the Areca hotel ( availability and pricing check here.. ) . Junior suites all have a bathroom with a hydro massage bath, and also include a sofa bed which can sleep an extra adult. The rooms are all very clean, and cleaned once a day. Towels are changed every day, bed linen is changed once every other day. If you are too lazy to go downstairs to eat then the hotel offers 24 hour room service. All of the rooms have toothbrush, shampoo, body lotion, towels, shoe polishing kit, and shaving kit. All of these products are of very high quality.Internet is available for free in your room if you take a wireless enabled laptop. Alternatively there is also a medium sized business centre which you can use. The restaurant provides top quality food, and can seat up to 70 guests. It’s a great place to go to enjoy sampling many different types of authentic Mediterranean cuisine. You can also eat outside on the garden terrace, weather permitting! 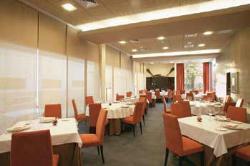 The hotel is also a very good business destination and has two meeting rooms which can seat up to 120 people. Of course what you should be most interested in is play, not work! It is very close to Elche which is regarded by many as one of the best beaches in all of the Costa Blanca. There is no other hotel closer to this beach. There are a staggering 9km of amazing sandy beaches along the cost of the Costa Blanca, so there’s plenty to do there. You can either sit and relax on the beach, play sports, or even swim in the sea! There are plenty of places to hire Jet Ski’s and windsurfing equipment from if you’re interested in that sort of thing, and there are also plenty of boat trips that you can go on. If you’re not into the tourist thing then you might like to try and soak up some local culture, to do this you can visit Palmeral de Elche which has been noted as having historical importance. If you enjoy shopping then there’s plenty of places for you to practice your hobby here! There are lots of shopping centers in Alicante. All of the staff in this hotel are very kind and patient, they are also multilingual and can speak French, Italian, German, Spanish and English. The level of service is outstanding!